Harold Meltzer obituary (via Frank Pandolfo), January 9, 2003. (The Journal News). Harold Meltzer, my favorite and best teacher of all, died on January 2, 2003 at the age of sixty-six, ten years ago last week. He was all too young and all too bitter about his years as a history teacher at Mount Vernon High School. But then, dealing with entitled parents and unrepentant administrators in Mount Vernon, New York for thirty-five years would do that to most people. Despite that, Meltzer was a rock, the first teacher since my elementary school years that I genuinely trusted with my family secrets and my inner self. He was the first and maybe only teacher I had in my six years of Humanities who actually seemed like he wanted to teach us (see my post “No Good Teaching Deed Goes Unpunished” from May ’11). I met Meltzer on our last day of tenth grade, after three days of finals and Regents exams, on June 21, ’85. He had summoned fourteen of us to “Room 275 of Mount Vernon High School,” as the invitation read. We had all registered to take Meltzer’s AP American History class in eleventh grade, our first opportunity to earn college credit while in high school. Meltzer started off talking to us about Morison and Commager — who I now know as the great consensus historians of the ’50s, until the social history revolution made their textbooks irrelevant by the ’80s — as we sat in this classroom of old history books and even older dust and chalk. Meltzer himself looked to be in his late-fifties (he was actually a day away from his forty-ninth birthday), tall and lanky except for the protruding pouch in the tummy section. His hair was a mutt-like mixture of silver, white and dull gray, and his beard was a long, tangled mess. Met Logo and A full house, seen from rear of stage, at the Metropolitan Opera House (former bldg, 39th Street), for a concert by pianist Josef Hofmann, November 28, 1937. (National Archives via Wikimedia). In public domain. The way he spoke, and the way his eyes looked when he spoke made me see him as a yarmulke-wearing preteen on his way to temple. The force with which his words would leave his mouth hit me immediately. As much as I noticed how frequently spit would spew out of Meltzer’s mouth, the rhythm of his speech was slow and sing-song, like an elder or grandfather taking you on a long, winding, roller-coaster-ride of a story. Most of all, I knew that he cared — about history, about teaching, about us learning, about each of us as people. Maybe, just maybe, for some of us, he cared too much. But for at least for me, Meltzer’s eccentric space in which he told Metropolitan Opera House stories and talked about egalitarianism extended beyond the historical. He was the first teacher I had since before Humanities who’d ask me if things at home were all right, and knew intuitively that things weren’t. He was the first to ask me about how poor my family was and about hunger. And he was the first teacher ever to ask if I had a girlfriend. Needless to say, these questions were unexpected. Yet through these questions, Meltzer had begun to crack my thin, hard wall of separation between school and family. Because Meltzer cared deeply about reaching students — about reaching me — our student-teacher relationship because a friendship after high school and a mentoring one as well. I wasn’t looking for a mentor, and Meltzer was only being Meltzer. Still, his stories about his battles with MVHS administrators, Board of Education folk, and with upper-crust parents who believed their kids were entitled to A’s just for showing up, were filled with lessons of perseverance, patience, and looking beyond everyday headaches in order to reach people. While this wasn’t a factor in my going to graduate school and spending a significant part of my life as a history professor and educator, these stories have helped me over the years. 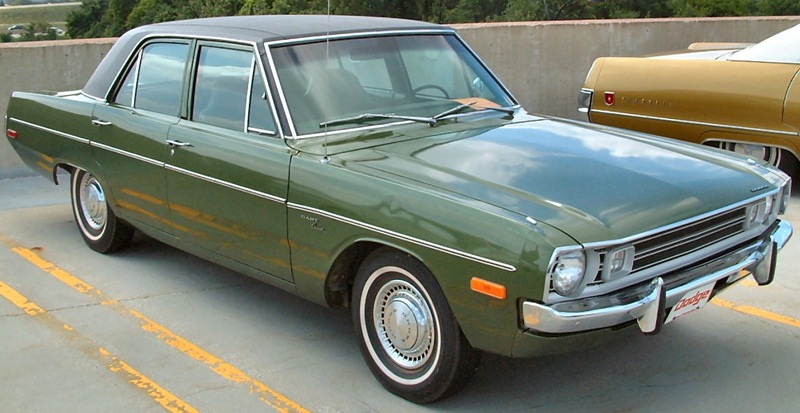 1972 Dodge Dart Dark Green (similar to ’74 Dodge Dart Meltzer owned when I was at MVHS), December 25, 2009. (http://www.fotosdecarros.com). But unfortunately, it was a factor in why Meltzer became embittered and took early retirement in June ’93. The end of the Humanities Program, the intolerance of some administrators toward Meltzer as a “confirmed bachelor,” the lack of decency — forget about gratitude — from many of his most successful students. Those changes, these things, all would take a toll on any teacher who’d stay after school day after day to run Mock Trial, to facilitate study groups, to work on letters of recommendation for students. But no, most of my former classmates who had Meltzer between ’85 and ’87, all they could say was that “Meltzer was weird” or that “I didn’t understand” his lessons. I’m thankful that I did have Meltzer as a teacher, friend and mentor between ’85 and ’02. I’m thankful that I had a chance to interview him for what is now my Boy @ The Window manuscript in August and November ’02, just a couple of months before he passed (see my post “Mr. Meltzer” from June ’09). I’m glad that despite his physical and psychological pain, Meltzer welcomed me with open arms and answered my questions about his life and his career. I just wish that my former classmates and some of Meltzer’s more cut-throat colleagues had taken the time to really know the man. 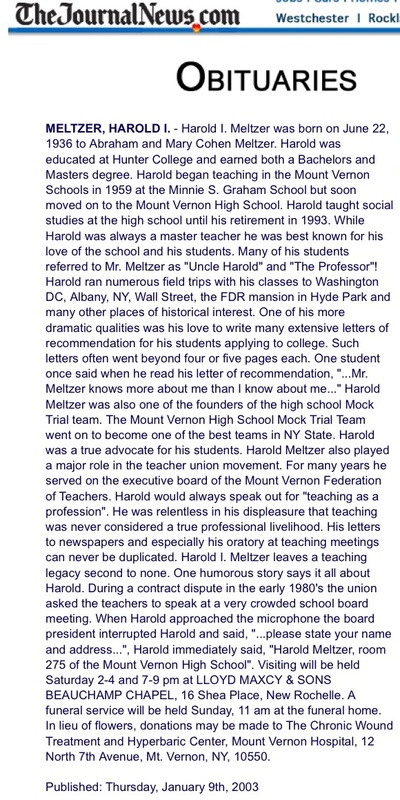 Harold Meltzer was one of the most kind and caring teacher I ever had. Mr. Meltzer had a heart as big as he was,I had him for American History in the 11 th grade in 1977 at MVHS he handed us an sheet with all we needed to know in order to ace his class ,he said all you need to do to get an A is study what’s on this page. He was a classy man who spoke eloquently but could also be quite funny. Mr. Meltzer was not only an excellent teacher,mentor and friend that you could talk to even if it didn’t have anything to do with class. I was truly lucky to have had the honor of having him as a teacher and a friend. Thank you for posting your memories of Meltzer here. He was a wonderful person and mentor, even in his goofiest and nuttiest moments. He was also very much misunderstood, particularly by his administrators and colleagues. That man watched my back at a time when virtually no one else in my life did. I’m glad he was there for you as well. Thanks again for posting your thoughts.